Incident Summary: A report of 3 separate grass fires started burning near the Alcoa/Malaga area 5 miles SE of Wenatchee later merged into one wildfire now called the Spartan Fire (renamed from the Alcoa Fire). Resources: There are 160 personnel deployed on this fire. 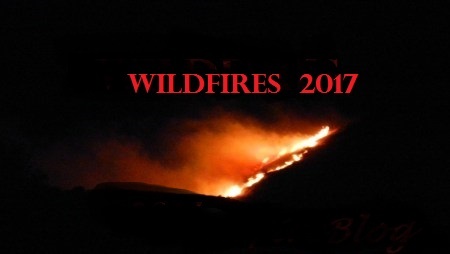 Incident Cooperators: BLM, Chelan County OEM, Chelan County Fire District 6, Chelan County Sheriff, WA DNR and US Forest Service. Size/Fuels: About 4,500 acres of grass and brushy fire fuels have been consumed. Fire crews have been able to gain a 10% containment status. Fire Managers: “Overnight hand crews and dozers successfully held the fire to the north of Colockum Road and west of Alcoa Highway. The most active fire spread was reported to the Southwest. Evacuations: Level 2 evacuation levels remain in place for the Spartan Fire along Colockum Road, Kingsbury Road, Moses Carr Road, Ingersoll Road, and Tarpiscan Road. Level 2 means to be ready to leave in an instant. There are approximately 80 structures threatened in this area. Level 1 evacuations are in place for the Sutherland Canyon Fire from the Columbia River to milepost 10 along the Palisade Road corridor. There are approximately 24 structures threatened. There have been no reported loss or damages to structures on either fire. Incident Summary: The Southern Canyon Fire formerly known as the Southern Fire is now incorporating 5 fires, that were also reported in the Palisades area 8 miles South of Wenatchee in Douglas County. It is now being called the Sutherland Canyon Fires. Size/Fuels: There have been 3,000 acres of grass and brushy fire fuels with a 10% containment status. Resources: There are 75 personnel assigned. A Type 3 IMT assumed command at 1000 hours on June 27, 2017. Fires or campfires, including those in fire rings, although personal camp stoves and lanterns fueled by propane, liquid petroleum or liquid petroleum gas are allowed. Welding and the use of chainsaws. Operating a torch with an open flame and all equipment powered by an internal combustion engine is prohibited. Fireworks are prohibited year-round at all 33 WDFW wildlife areas and 700-plus water access sites around the state. Throwing a lit cigarette or any other burning material from a motor vehicle on a state highway also is prohibited year-round. WDFW owns and manages over 700,000 acres in eastern Washington. The restrictions in these areas will remain in effect until conditions improve and the risk of wildfires decreases, Wilkerson said. Any changes will be posted on the department’s website: http://wdfw.wa.gov.” – “Cynthia Wilkerson, WDFW Lands Division Manager. ← CALIFORNIA WILDFIRE | MART FIRE | NEW!